The Pigeon River Country State Forest’s expansive 105,000 acres offers a unique wilderness experience that is just a short drive from downtown Gaylord. 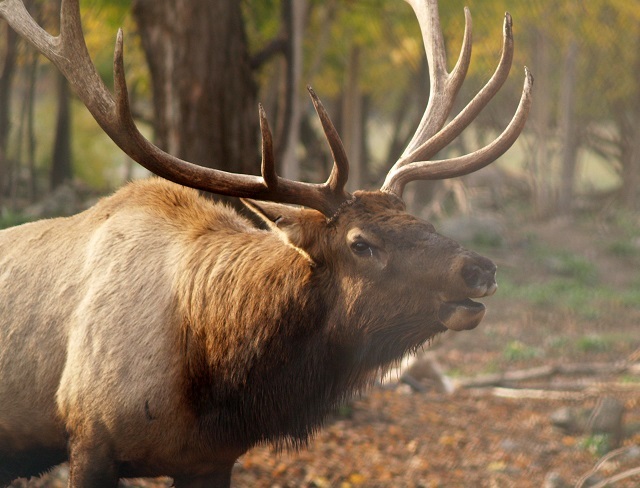 Home to one of the largest free-ranging elk herds east of the Mississippi, the Department of Natural Resources maintains this flourishing elk habitat through careful forest and wildlife management. Elk inhabit this site year-round, but certain times are better for viewing than others. Generally, the best months are September and October when the males (bulls) are trying to establish dominance for mating rights with the females (cows). They are extremely active during this time, making loud vocalizations (bugling) and breaking brush with their antlers to impress cows and intimidate their rivals. If you plan to visit during this time, try to arrive mid-week, as elk viewing has become very popular and weekends can be crowded at known viewing sites. Another good time to view elk is from late April through early May. Elk are active throughout the daylight hours eating the new green growth and there are few people out to see them. Several elk viewing sites have been established in the Pigeon River Country State Forest. These are not the only places you can see elk, but they are located in known gathering spots and are good places to start. The best viewing is done from your car, since elk are accustomed to seeing cars. Use binoculars or spotting scopes for best results. Do not approach elk. Despite their large size, they are timid animals and will not tolerate much disturbance. 1. On Fontinalis Road, about three miles north of Sturgeon Valley Road and near the Cheboygan County line, you will find a small cleared parking area and field. 2. At the DNR-signed elk-viewing area on East Sturgeon Valley Road, about eight miles east of Vanderbilt. 3. Less than one mile north of the Osmun Road and Clark Bridge Road intersection in the Pigeon River Country State Forest. 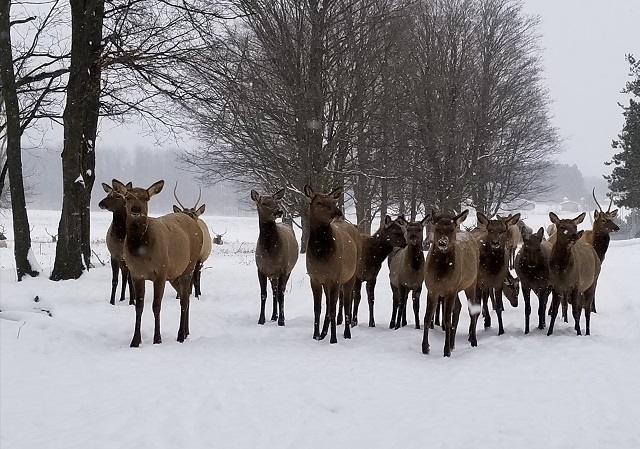 The Michigan DNR offers a comprehensive guide to elk viewing with a map, tips for the best times to view them and interesting facts. Click here to view online. The City of Gaylord maintains an elk herd and provides viewing areas for the public to stop and watch these impressive animals. Under the City’s care, roughly 70 elk can be viewed from near the Elk’s Lodge off Grandview Blvd. The herd is contained on 108 acres. City staff feed the animals corn, hay and sugar beets, plus vitamins. The herd started with three elk 14 years ago, when a local nature center closed. Currently, a few of the bulls weigh well over 800 pounds and stand roughly 6′ tall. The bulls will don their massive antlers during the fall and winter, dropping them in the spring.